Designed for use with marine and utility trailers, Fulton brand XP tongue jacks are time-tested and application-proven. their bolt-on versions include all necessary mounting hardware. XP 15 mount features 1/2 inch pull pin. The Fulton brand XP bolt-thru swivel mounts (U.S. PAT. 6,302,381) use 3-D formed heavy-gauge steel stampings and a proprietary bushing material for a mount with minimal deflection and maximum support. 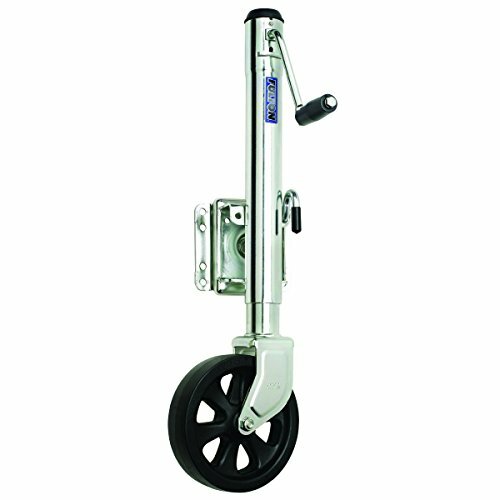 Mounts have multiple mounting positions up to a 3 inch x 5 inch trailer frame. 8 inch diameter wheel, handle and wheel are shipped unassembled.